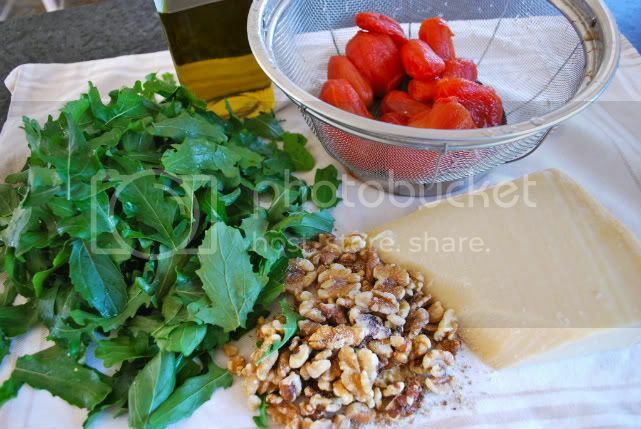 This is one of my favorite things to make and with a serious abundance of arugula in the backyard it is perfect timing. This is a very easy recipe that changes every time I make it depending on what I have in the pantry. I do the entire thing in my blender, I am sure that the Cuisinart on the top shelf in my pantry would be even better but the thought of cleaning that thing kills me. Any way, just throw everything in and 'blend' or 'pulse' until it is creamy. Boil water and make your pasta. This particular pasta only takes a few minutes. I am totally hooked if you haven't tried it you will love it. 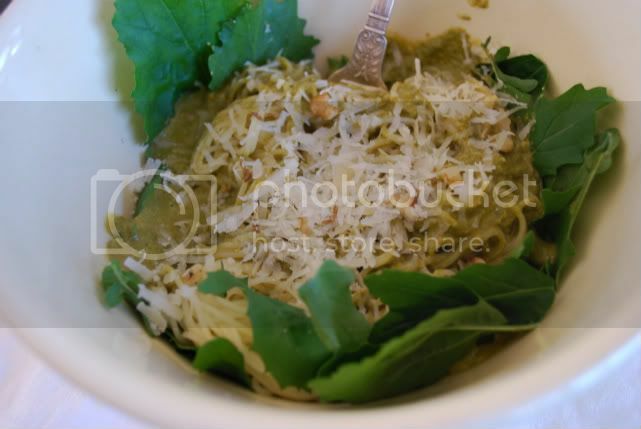 While your pasta is cooking, line a bowl with arugula leaves, drain pasta and pour over leaves, then pour on your pesto. Sprinkle on some parm, warm up a baguette and viola dinner. yum. Arugula is my FAVORITE green thing! I'm making this TONIGHT! Might have to be my summer standard Wednesday!